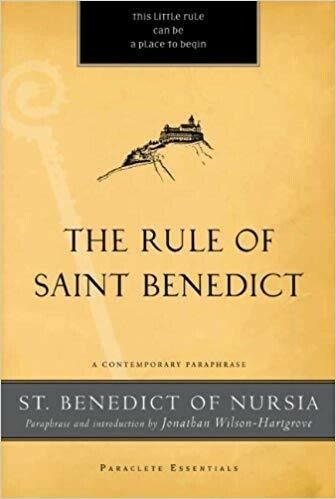 Discussion around the bestseller The Benedict Option by Rod Dreher has led many people to want to know more about Benedictine principles. Listen, my child. I want you to put the ear of your heart to the solid ground of the master’s wisdom (what I received, I’m passing on to you). It’s advice from a spiritual father who loves you—the sort of counsel you receive by letting it shape your whole life. Listening is hard work, but it’s the essential work. It opens us up to the God we’ve rejected by only listening to ourselves. If you’re ready to give up your addiction to yourself, this message is for you: to listen is to equip yourself with the best resources available to serve the real Master, Christ the Lord. So begins the famous opening paragraph of Benedict’s Rule in Jonathan Wilson-Hartgrove’s vital, new, contemporary paraphrase. The entire text of the Rule is here plus a lengthy introduction from Jonathan, and detailed explanatory notes throughout that explain difficult passages. The result is a classic re-introduced that will enliven any 21st century expression of religious community.